As soon as Facebook introduced Videos on the social network many of us have found ourselves sifting through countless videos of comedy sketches, cooking tutorials, hair tutorials, and a lot of other content. However, very few have questioned where this content originates from as it is posted by different pages, and the truth of the matter is that most videos have been stolen from. Right after Facebook made the announcement that, they generate 8 billion views from video viewing, content creators are accusing Facebook of creating an environment that promotes content theft. 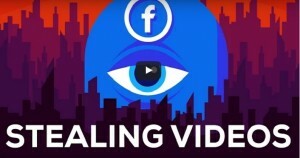 One of the accusations is that 75% of the most viewed videos on Facebook have been stolen from networks like YouTube and Vine, as Facebook users can simply post any video from mostly YouTube and enjoy the benefits that come with it. And the reason content creators who make these videos are upset it that, they do not receive any ad-revenue or exposure from the video being posted on facebook by an unrelated page or person. Also facebook is being accused of rigging its algorithm, essentially in a way that you are more likely to come across a facebook video than a video that benefits a content creator from youtube. Facebook is also being accused of cheating on video views, and the basis of this is that on youtube one view count is only recorded after you watch the video for at least thirty seconds whilst the autoplay feature on youtube records one view count just by scrolling past a video without clicking on it. Lastly the biggest problem occurs when content creators try to have a video posted without permission to be removed, they complain that there is just too much redtape involved in trying to have something removed for copyright infringement.